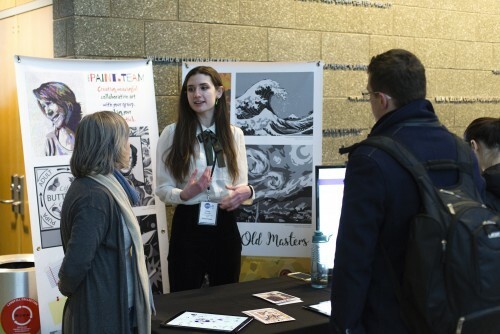 MICA is thrilled to announce this year’s eight UP/Start Venture Competition finalists, who were selected from a total of 27 applicants following their presentations at a “pop up and pitch” event on Friday, Feb. 1. The finalists’ businesses represent a wide range of ideas, from a lifestyle brand + safe space platform to representative comics to targeted virtual reality content for use in therapeutic settings. The finalists will compete for seed funding totaling $100,000, funded with support from the Philip E. and Carol R. Ratcliffe Foundation, at the finale event. Each finalist will make a final pitch to a new panel of judges (to be announced at a later date), and the funding will be allocated to the winners who present the most compelling and innovative entrepreneurial ideas. The finalists will also each be paired with an industry leader or investor as a mentor to refine their business plans and presentation skills in the weeks leading up to the finale event. This year, an additional peer mentorship component has been added to the competition, and finalists will be able to tap into the firsthand experiences and lessons learned by previous UP/Start winners. Following the end of the competition, winning ventures will be able to introduce their companies to the Baltimore Angels, an opportunity that creates a continued educational experience and way to gain feedback and insights from active angel investors. The finale event is free and open to the public. It will take place Wednesday, April 17 in the Brown Center, 1301 W. Mount Royal Ave. Attendees will have the opportunity to vote for their favorite venture to receive an additional $5,000 prize as the 2019 "People's Choice Award." AMAZING INDUSTRIES is a R&D startup exploring the future of work in the digital age. Through the use of investigative journalism, writing, documentary video and installation and other disciplines, AMAZING INDUSTRIES researches questions such as how are new technologies, such as AI, transforming work. Erose is a lifestyle brand + safe space platform devoted to healing through storytelling + developing healthy emotional habits in ourselves so we cultivate healthy romantic partnerships with others. GPG Technologies is dedicated to one mission: doing the greatest possible good. The company designs sustainable solutions for people and planet. Its first product, the Saqua bottle, is a reusable water bottle that is easy to clean and elegant in its simplicity. Greenmount Tile is an architectural ceramics company that creates limited edition artwork. Its installations include art for public space, experimental structural design, and suspended tile. Hilarious Comics is a brand that seeks to redefine the term superhero while also highlighting underrepresented characters in comics, such as female characters, characters of color, and queer characters. Lucky Pocket Press is an artist collective and risograph press that strives to tell stories through unique and unconventional handmade merchandise and comics. Paint.Team’s mission is to inspire creativity and collaboration through a web application that allows users to team up and create finished works of art from anywhere in the world. Virtual Scout creates targeted virtual reality content for use in therapeutic settings. The company is making immersive natural environments and utilizes a low-cost subscription-based model, as well as selling low cost VR viewers. UP/Start, an initiative of MICApreneurship, spearheaded by the Joseph Meyerhoff Center for Career Development, focuses on building creative business ventures within the College community, and provides capital and mentorship with industry partners to help nurture ideas into sustainable businesses. The competition is open to MICA students in the class of 2019 and alumni from the class of 2018. For more information, visit micapreneurship.com.